It’s no secret that Hazel by Noodlesoft is one of my favorite applications for keeping my paperless documents organized on the Mac. Today I felt the need to talk about an insanely useful feature introduced in version 4: the Hazel Preview Button. To use Hazel for going paperless, what we’re doing is having it recognize the text inside our PDFs. 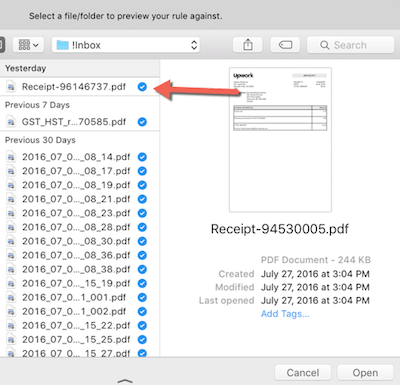 It then recognizes the bill or other document and automatically names it and files it away. If you’ve done this, you will know that it can sometimes be a bit fiddly getting your rule set up just right. It can sometimes take a few times of going back and forth before it recognizes the text and takes action. The Preview button, which is my new best friend, eliminates that back and forth. You can tell if your rule is going to work before you even hit Save. Let’s take a look at how it works. I am setting up a rule and to move a receipt that I receive every month. In this case I have it mostly set up, but I could have done what I am about to do earlier in the process. I’ll hit the Preview button to get the party started. Next it will ask me for a file to Preview my rule against. I’ll choose one of the receipts I want to automatically move. When I choose my file and hit Open, it will test my rule against this PDF. Now the preview is going. I can see that two of my conditions pass, but one of them has a red X which means what I am telling Hazel to look for is not in my sample PDF. This means that once I save the rule, it is not going to work. As far as Hazel can tell, the word “Honeyleen” does not exist in my PDF. Once I change that third condition to look for “Upwork Global”, the preview changes to a green checkmark and it says Rule Matches beside the Preview button. Success! I am confident that the rule will work when I hit OK to save it. This Preview button introduced in Hazel 4 is one of those seemingly small features that makes a piece of software even more of a pleasure to use. I love this button. I am very interested in your findings regarding note taking-the apple pencil and new iPads. I too tried using digital pencils and note taking apps some time ago and found them to be unacceptable. Having tried the Apple pencil this weekend it works very well and feels very good. I have mentioned to you in the past that I have memory issues and and exploring sketch notes hoping that this process will improve my recall. Typing is fast and efficient but does nothing for my cognition or recall. Would like to combine sketch notes with Evernote for fast recall. Please let me know what you think.